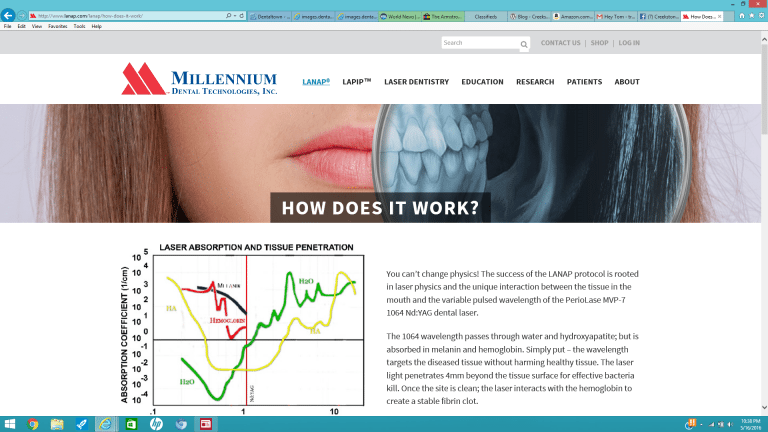 LANAP [Laser Assisted New Attachment Protocol]–Why does it only work with only one kind of Laser? Some lasers do some things, not one laser does everything. The NdYag laser energy is absorbed by the color purple, blue and black–which allows it to remove diseased tissue and leave healthy gum tissue unharmed. That is the key [the chart at left shows in detail exactly this effect]. LANAP cannot be performed with any other laser type: CO2, diode or Erbium–only the NdYag. Anybody who says differently is unfamiliar with the most current clinical research, as well as the the latest FDA position on LANAP, which called LANAP “. .true periodontal regeneration”, the first and only time it has said so.